You just can't go wrong with smoked burgers stuffed with a big ‘ol hunk of cheese and wrapped in long, tasty slices of cured pork belly. 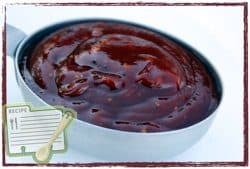 To make matters even better, they are dusted with Jeff's original rub and finished off with a rich slathering of Jeff's original barbecue sauce for a glorious finish. Pull the meat up around the top to cover the cheese and seal the meat closed. 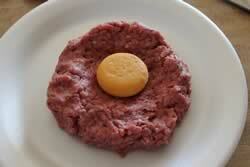 Press the meat down into a thick patty. 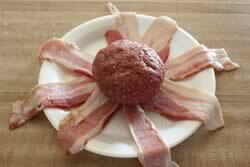 Lay 3 or 4 slices of bacon in a criss cross fashion on a plate, cutting board, etc..
Lay the burger in the center of the bacon slices and wrap the bacon up, and over the burger. 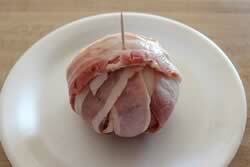 Push a toothpick through the bacon and into the burger to hold everything in place. Tip: if you like the bacon to be extra crispy when finished, Pre-fry the bacon before wrapping it around the burgers but don't fry it as long as you normally would. You don't want it to be crispy just partly done so that it is still flexible. 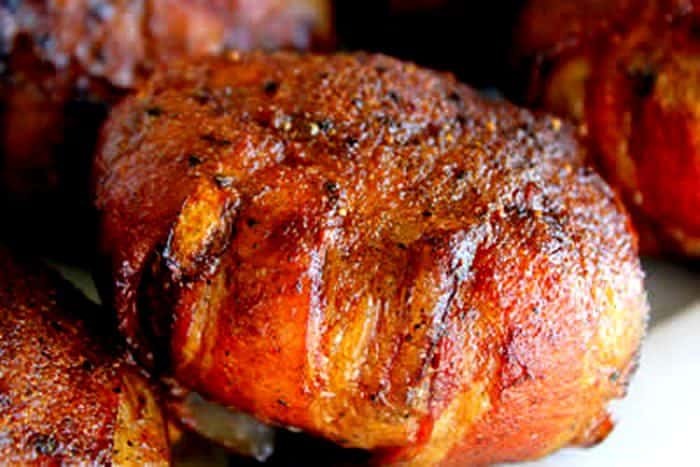 Sprinkle the outside of the bacon wrapped burgers liberally with Jeff's original rub (purchase recipe here) and they are ready to cook. 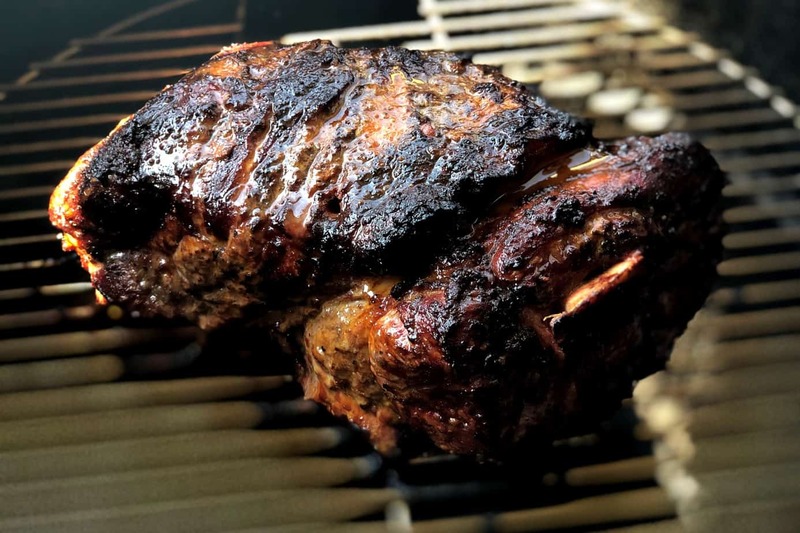 If you are using a gas grill, which some of you do, there' s a few things you can do to both cook the meat and add some smoke. 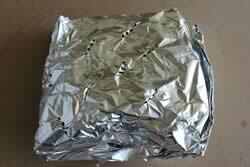 Foil Packet with Wood Chips: In general, you just wrap a handful of dry wood chips (I used grape wood chips that I found at our local Ace Hardware) in a large piece of foil. 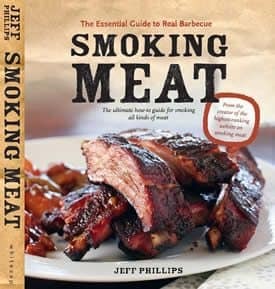 Poke a few holes in the top using a fork or other sharp object to let the smoke get out. Here is a more detailed instructional for making a foil woodchip pack. Place the foil packet above the flame either on the grate just above one of the burners, just below the grate but above the burner. The main think is that it must be above the flame and close enough to the flame to make the wood chips smoke real good. I have a Charbroil Red Infrared grill with 4 burners so I just place the packet down in the pans or sometimes I just place dry wood chips directly in the pan itself without even being wrapped and both configurations work well. You will have to experiment a little to see what works best with your grill. Smoke Generator: This is basically any device or machine that “generates” smoke allowing you to add flavor to food such as on a grill, cold smoking cheese, etc.. I use the A-Maze-N products for this. It's a small metal maze or tube (depending on the model) that holds pellets. The pellets are lit and after just a few minutest the flame goes out leaving you with a “cherry” that travels from one end of the device to the other smoldering the wood pellets and creating smoke. It can take from 6 to 11 hours to go from one end to the other just depending on what device or model you get and whether you light one end or light both end for double smoke. What a great invention for things like gas grills! 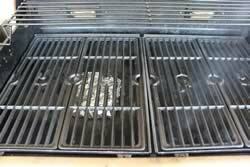 Cooking on a Gas Grill: This is a combination of low indirect heat followed by high direct heat and works best using zones. Try to create a side of your grill that is low heat and a side that is high heat that way you can move the burgers around to achieve the desired result. 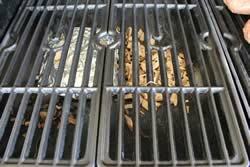 This is especially easy to do with a charcoal grill but is possible in a gas grill as well by adjusting the burners. I recommend placing the burgers on the low heat side of your grill. 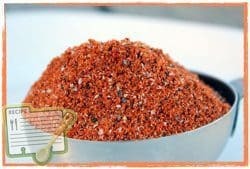 Dust them with my rub for loads of flavor and let them smoke for about 25-30 minutes. 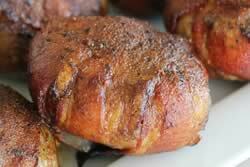 They can then be moved to the high heat side to help crisp the bacon. The burgers will need to be turned over about 10 minutes before they are done to allow the bacon to crisp on both sides. 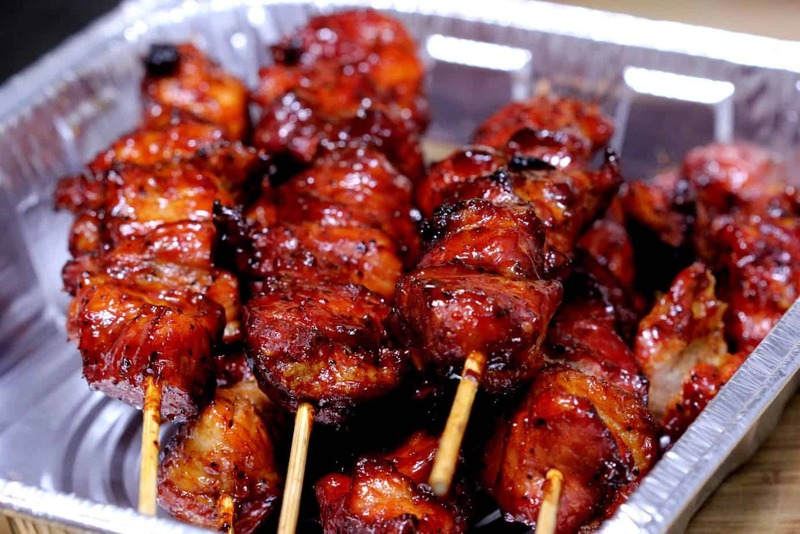 Brush them with my barbecue sauce once you turn them over for a flavor you won't soon forget. 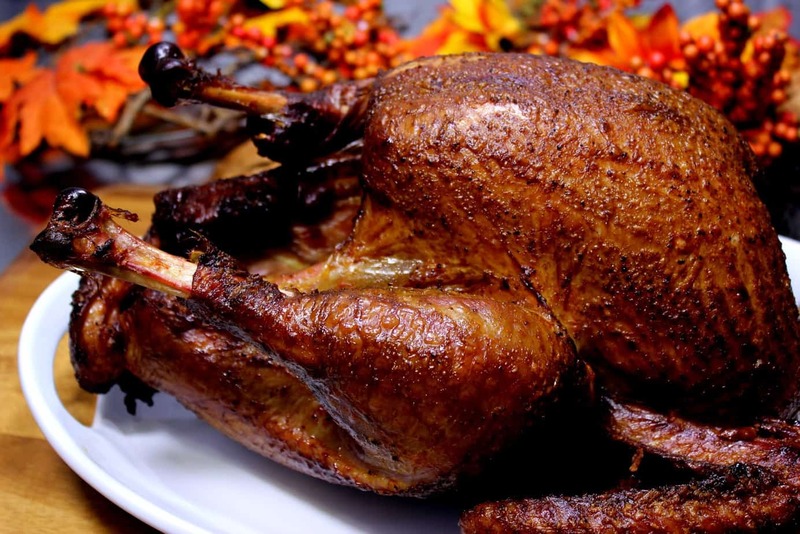 Cooking on a Pellet Grill: Pellet grills are all the rage now and some might think that because they are called “grills” they are similar to a gas or charcoal grill and are meant for hot and fast cooking. Well, they'd be wrong. 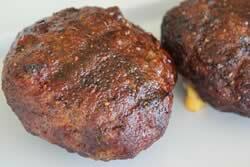 I use my pellet grill for low and slow cooking all of the time but then these burgers do best with a combination of low and slow and hot and fast so maybe a pellet grill is the perfect unit for these.. I think so! Burgers only take about 1 hour to cook at 225-240°F but if you place the pellet grill on the specialized smoke setting (they all have one) for about 30 minutes before cranking them up to 350°F or so, you'll have smoke flavor and bacon with a good bite-through on the outside. For best results, remove the burger from the grate, into a pan when they are done smoking, crank up the heat and once 350°F is acquired, place the burgers back onto the grate to finish. About 10 minutes before they are done, brush on some of Jeff's original barbecue sauce . 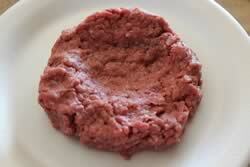 Use a handheld thermometer such as a Thermapen to test the internal temperature of the burgers. They are done at 160°F. 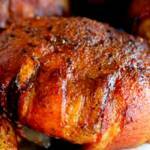 Cooking on a Regular Smoker: Set up your smoker for cooking at 225-240°F with indirect heat. If your smoker has a water pan, fill it up. Smoke cook the burgers for about an hour, no flipping required and keep the smoke going the entire time. When the internal temperature reaches 160°F, call them done. You can also give the bacon a better texture by only leaving them in the smoker for about 30 minutes then throw them on a hot grill to finish. About 10 minutes before they are done, brush some original barbecue sauce onto them to make them extra tasty. You Don't Want to Use Bacon? No problem.. follow the same procedure and be sure to brush on plenty of barbecue sauce when they are about 10 minutes away from being done. Regardless of how you choose to cook the burgers, Use a Thermapen or a ThermoPop to test the temperature and when the center of the burger reaches 160°F, it's perfectly done. Use premium hamburger buns, red onions, leaf lettuce, heirloom tomatoes and your favorite condiments (Cheese already included) and chow down! 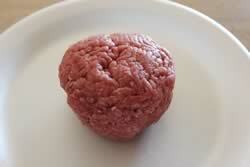 Follow my recipe exactly and your guests will be asking you for your secrets to making perfect burgers! You just can't go wrong with smoked burgers stuffed with a big 'ol hunk of cheese and wrapped in long, tasty slices of cured pork belly. 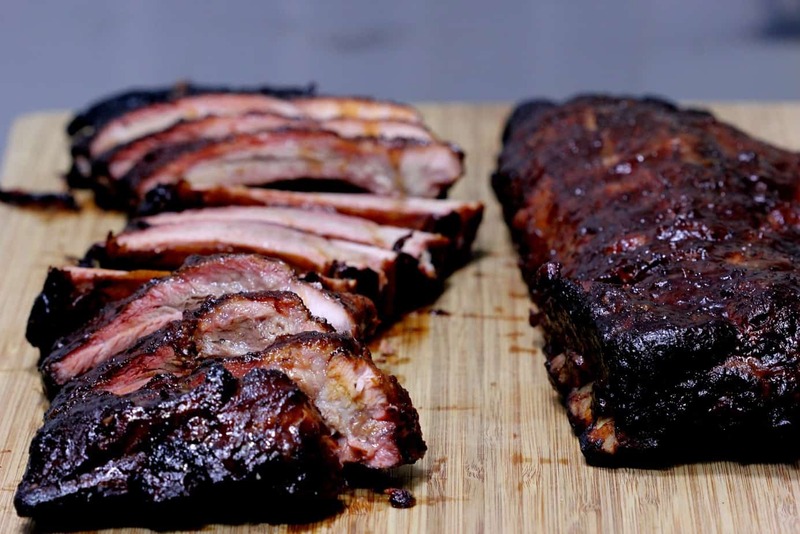 Dusted with Jeff's original rub and finished off with a rich slathering of Jeff's original barbecue sauce. 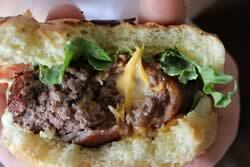 Provide buns, veggies and condiments for the best burgers in town! I don’t have access to a grill, but I’d like to make these in my oven. How hot should I bake them at?